UK newspapers have criticized president Barack Obama for his comments about BP following the Gulf Coast oil disaster. Analysts question the true value of the UK-U.S. "special relationship"
(CNN) -- British media have leapt to the defense of beleaguered BP following attacks by the White House over its handling of the Gulf Coast disaster. President Barack Obama has taken a tough stance against the company and its response to the April 20 explosion, which killed 11 workers and has spilled millions of gallons of oil into the Gulf, threatening livelihoods and wildlife. But now UK opinion formers have weighed in, attacking Obama's approach, warning of the threat to pension funds and questioning relations with the United States. Cameron is told to "stand up for your country" by the Daily Mail, which backed the Conservative leader at last month's UK election. It points out while "British marines continue to die in Afghanistan -- fighting valiantly alongside their American colleagues," relations between the respective leaders means the phrase "special relationship" sounds increasingly hollow. In a leader column the newspaper says Obama's attacks are "rank hypocrisy," coming only weeks after the president advocated deepwater drilling. Elsewhere it highlights oil disasters off the UK coast involving U.S. companies, including the Piper Alpha oil rig explosion of 1988, in which 167 people died. The Lex column in The Financial Times says that the manner in which the crisis is "moving into the diplomatic sphere is surely a positive for BP -- providing a much needed counterweight to Mr Obama's swinging boot." Meanwhile Philip Stephens, also writing in the same paper under the headline "Some home truths for a president showing the strain", says that "Deepwater is only there because the U.S., with a twentieth of the world's population, consumes one-quarter of world oil." The leader opinion in The Daily Telegraph points out that BP is a multinational company, 40 percent of whose shareholders are American. "The long-term relationship between Britain and America should not be jeopardized by a presidential response that has been more petulant than statesmanlike," it continues. The Telegraph says it is disappointed that Obama, "a politician whose reputation was built on his powers of persuasion should be so quick to inflame a difficult situation for his own political ends. We had thought better of him." 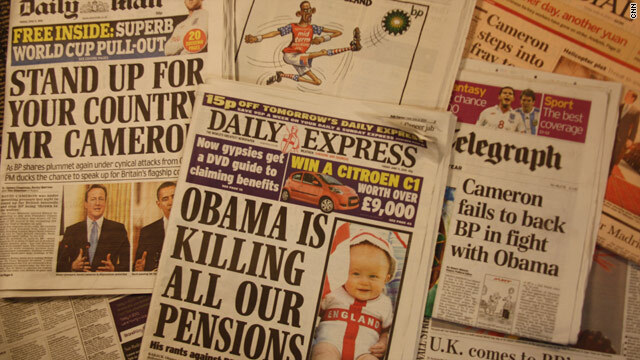 Obama is told to "stop ranting against BP" by the Daily Express, which leads with the headline: "Obama is killing all our pensions." Many British retirement funds, both public and private, invest in the oil company, which has seen billions wiped off its share price this week. "Nobody disputes that an environmental catastrophe has taken place," the Express says. "But BP is only one of three major companies involved. It is difficult to avoid the conclusion that it is being persecuted because its first initial stands for 'British' and Britain should not put up with that." Malcolm Rifkind, foreign minister under the last Conservative government, asks in The Times whether "the great British love-in with Barack Obama may be coming to an end." "While there has been deep understanding of the environmental catastrophe that has struck the United States and of BP's responsibility, there is also growing concern that the President's angry rhetoric is going over the top and risks dividing the United States and the United Kingdom. "Mr Obama must understand," continues Rifkind, "that an American president does not just have a domestic audience. Whatever their political purpose for his own electorate, his words resonate throughout the world and, however unintended, can have serious and damaging consequences." In The London Evening Standard Chris Blackhurst wrote: "There are three words to be thrown back at President Obama: Bhopal and Agent Orange. In both instances, the U.S. inflicted huge suffering on others -- and did precious little to remove the toxic pollution it left behind." Nearly 4,000 died in the Indian city of Bhopal in 1984 following the escape of lethal methyl isocyanate at a plant owned by Union Carbide India Limited -- the now-defunct local subsidiary of the American chemical company. Agent Orange was used as a defoliant during the Vietnam War -- but its toxins have been linked to thousands of deaths and illnesses. "BP has not called itself British Petroleum for more than 10 years," adds Blackhurst. "It's not the only one to not use its full name. Barack Hussein Obama is another."